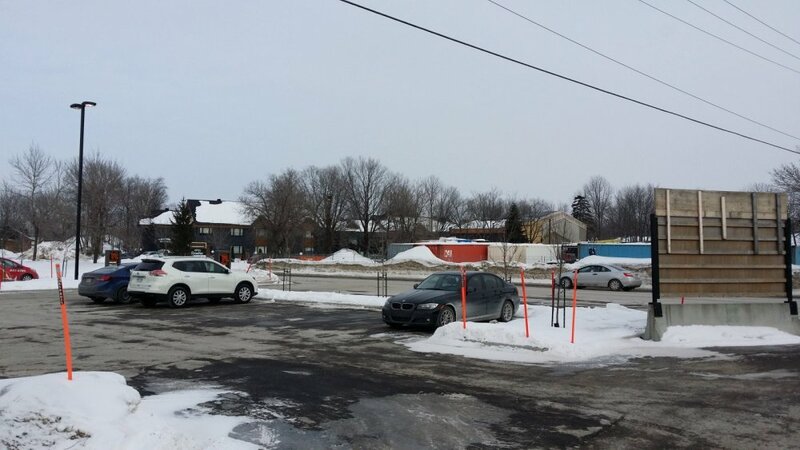 On our trip to Lac St Jean, we noticed construction in the parking lot at Hotel Bernieres, St Nicholas. We stay here often and decided to see what was going on. At the front desk we spoke with the manager Jean Luc. He said the construction is for the new restaurant. The small house and the lock up for the trucks are gone. The restaurant is scheduled to open this summer. Once the new restaurant is completed, the older section of the hotel and restaurants are going to be renovated. The renovations should be completed in 2018. Jean Luc wasn't sure if there would be a lock up for the trucks after the construction. Right now there isn't a lock up. When it is completed, the hotel will be where it has always been but the food will be across the street in part of the big parking lot where all the trucks and trailers have been parking. There will still be parking there but not as much. This is the lot that the transport uses to take you and the sleds across the river to Hotel Colibri. I'll save my opinion until after the construction is completed but I will miss the lock up if it is gone forever. We stayed once this year, no issues at all. Yes, no lock-up anymore. Leave your Escalade at home and bring the old dodge. JG you remember! That was a trip that we would like to forget about. I started the trip post in the Eastern Township region out of Valcourt. Maybe I should have put it here. 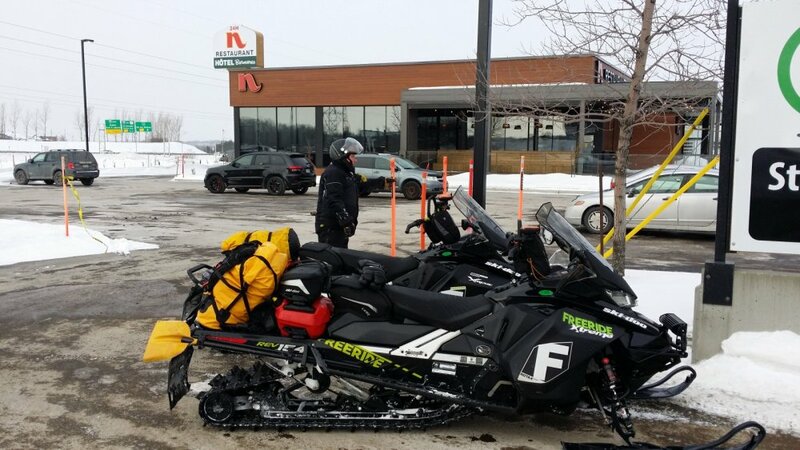 The ride out from Valcourt was good albeit the wet sticky snow. Better than freezing rain. Left truck and trailer at Berniers tuesday noonish, and rode northeast. Yes the trailer area is smaller but still works. Rode to Montmagny for the nite. Weds rode mostly 5 East to Rimouski. Trail conditions tues and weds perfect. Then Thurs in rain to NB border and over to Cabano. !st time there, stayed at motel Royal. Cheap, right on the Lake and good rest and bar next door. I would stay there again for sure. Trails even thursday were near perfect despite 40F afternoon temps. Friday we rode 85 to 35West. For those that have never tryed it, 35 is a ridiculously fast rail bed that was still fairly flat the entire way back to 547 , where we turned North to pickup 5/75 into Berniers. But the last 50 miles trails were showing some serious wear, snirt and puddles. Then on 5/75 west, about 18 miles from Berniers the Chaudiere river was shut down, and we had to ride bare roads over a bridge for a couple of miles.. The water in the ditches along the trails is rising fast in this area. To top it off last nite they had an ice storm with 1/2 inch of ice on everything. Took us a while to chisel out the truck this morning. To me, they wil now need some cold and an inch or two of new snow, to get this area back in shape. They still have a deep base on most of it. Hi Tom. The three water crossings not far from Bernieres can be a washout. One is an easy cross on the auto bridge but the other two present more of a challenge. Glad you were able to get around the water. Sounds like the rest of your trip was good. 35 is the trail to take if you want to make time. Just make sure you gas up when you can. You will burn through many liters quickly! Except for the rain it sounds like you had a pretty good trip Tom. You could also have left from the Beauceville Clubhouse and save a bit of driving the black trail in favor of the white. Not sure if you've been through there before but it sits right at the junction of 55, 75. We frequently leave from there and head to Montmagny or RDL for the 1st night. Tony + his wife Linda are great people and run a nice, clean place there at the Motel Royal. Pub du Lac restaurant down around the corner is always a good bet also. I, too highly recommend both places to QR folks. Our typical starting point when trailering is Shawinigan. 5hrs door to door. 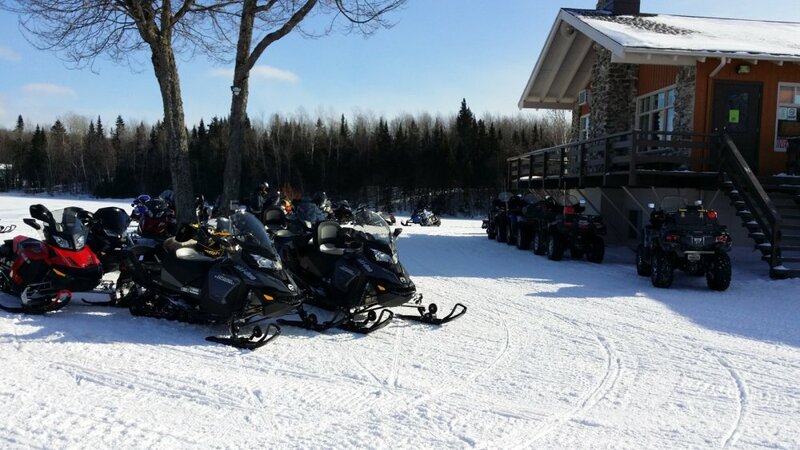 Because its North of the river its a little colder and its just a quick sled ride to the super stuff beyond La Tuque, St Raymond, etc. We typically get into Shawini at noon then ride to St raymond and stay at Auberge Alexis in town, right on 73. Used to stay at the Roquemont, but it slowly became a yuppie haven. the last straw was when they pulled the pool table out and replaced the bar stools with tree stumps! Alexis rooms are cheaper, beers are cheaper, pool tables,and the pizza is better than anything at the Roquemont. But if you ride with the ladies..., they will want the Roquemont. Its cute. Hi Tom, couple of us are thinking of leaving from Berniers this Friday and heading up and around Gaspie. Thoughts on leaving from Berniers? Also check trail conditions on FCMQ site. Very up to date. If it was me Id start from the universal in Riviere du loop. Only 1 and a half to 2 hrs farther, but I dont think there are any water crossings on trail 5 up that way. Plus its colder, trails will be better for sure. Update on Hotel Bernieres. We rode by on the way home earlier this week, Jan 16th, and took a few pics. There is a sign in front of the hotel saying it will open the end off January 2018. There are a lot of contractors there but I will be impressed if it opens that soon. The lobby would have to be re-located because there is nothing where the old lobby was. The original part of the hotel was to the right of the pic and is gone. These two pics are of the section that was built a few years ago and will not be torn down. Contractors pouring cement at -12̊C (10̊F). How do they do that? The trail crosses the road in the same place but then runs along the edge of the road instead of going behind the businesses. Looks like easy access to the Normandin. St. Hubert is a little further down the street. The motel is to the right side of the road by the blue construction trailer. Don't forget the Police Department is on the right before the gas station. There is still a lot of work to be done on the hotel. I hope there is parking for truck trailers when it is completed. Open for business, per their website! Yes, Bernierres is open as of last week, still looks like construction going on but Denis who drives the shuttle said they opened last week. 603 back country and I rode from Rockwood Maine to St Raymond. Conditions in the Chaudieres would be called excellent! A little choppy on the north side of the river to St Raymond. High sled counts today despite the Cold weather. On to the Gouin tomorrow to meet up with Trail blazer for the super bowl and some "fish" for dinner. Hi RR if it was discussed I missed it, what was the issue with 603's 850, if I may. Phil, he lost a crankshaft bearing, from what we understand, this was an issue with a few 2017 .. 850’s. All warrantee, but made for. Frustrating trip. Thanks I have heard of very few 850 failures. I see you are riding a 154 that seems to have a fairly large paddle track, I know you spend a lot of time off trail thought I know you do trail ride some. Any issues with burning hyrax or overheating? I have been thinking 850 BCX with a 1.6, seeing you ride that Freestyle I guess the BCX should handle the same type of service effortlessly. Yes I am headed back to the 2 smoke side of life. Phil, I took the 2.5 track off, that came on the Freeride and run. 2.0, it’s kind of hard to find that perfect combo for my riding off ...and on trail style, so this comes close. I run 2 sets of scratchers when needed, but otherwise find this to be a good compromise. We all talk how the 850 BCX with the 1.6 is very close to the perfect mix! RR thanks for the time and information. Interests:Snowmobiling , Boating on the great lakes, traveling. Did a little more recon today at Bernieres. Friendly girl at desk gave me the following info. Don't know about sled tent coming back or not. Truck compound will not be back. Parking is available across the road behind the normandin. Hotel will give you a tag to hang on your mirror. They still have cameras. There were a handful of trucks there today. Thanks for the intel Northbound. Used to love ridding that region. Had it all booked up for this week to ride it with my son Kwiknick . Cancelled dues to weather. 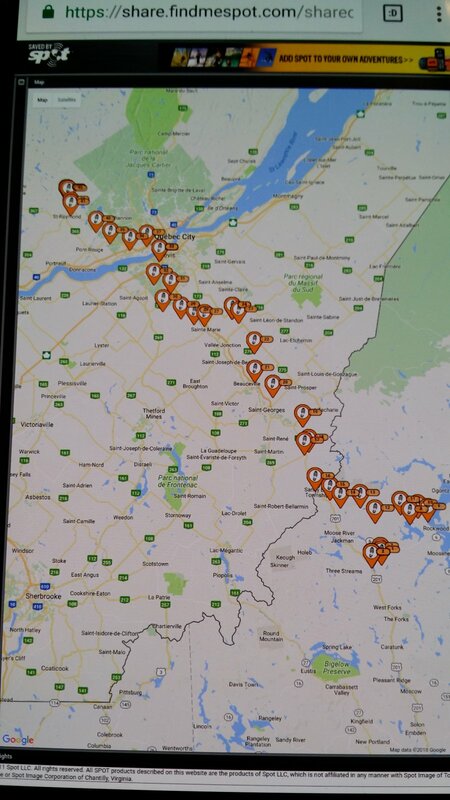 We are leaving now Saturday to RDL to Matane over on ferry then going to tear up Cote Nord and back all next week. Have a fun trip ! We are doing a similar trip and we usually stage from Bernieres or 4 points. Parked at Normandin a few weeks back. The tag will cost you 10$ but they give you a 10$ gift card in return. Bernieres is still in the snowmobiling world. We were a little worried when we heard that Normandin was coming in last year but it looks like Bernieres hasn't forgotten about us. They should be fully operational for next season. I think September is their target date to open the rest of the hotel. They may even have a small breakfast setup in the new hotel. No kitchen but I guess you could call it a modified European breakfast. Also look at that square hole in the corner just outside of the hotel. Swimming pool or hot tub?